This is a fun one for an older child to make for the playful dad. Your child could make one for themself and one for dad. Quality time to follow with slinghot competitions in the backyard! They can even make personalized bullseye papers to go with it! For the dad who enjoys nature. This handmade bird feeder will last much longer than a wooden feeder, giving dad years of relaxing on the back deck watching the birds! If dad loves Star Wars, this Darth Vader hanger is a great handmade gift. Dad can hang it on his office door, car mirror, or even on a wall. Personalize a shirt for dad using his favorite color shirt and a little paint! Here is a good one for the dads who love to grill! Even little kids can help make this gift! For those who are purchasing a gift, make it extra special by making this creative bow using items laying around. Superheros need to sleep too! 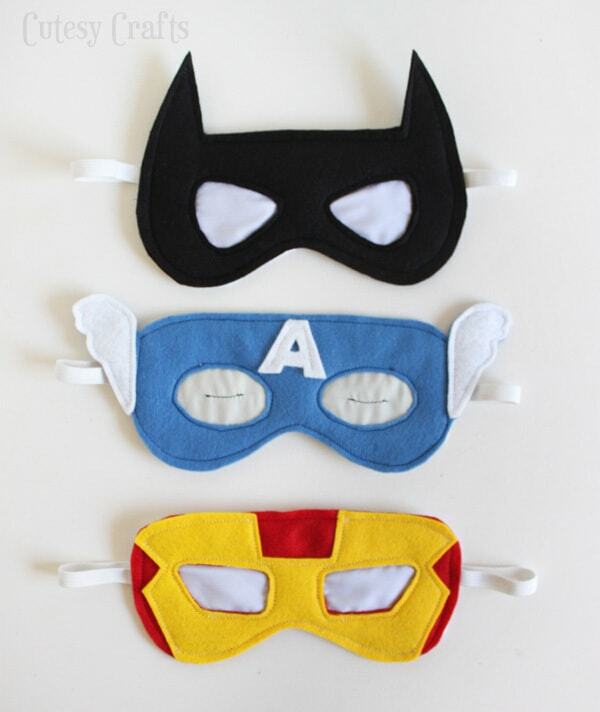 Let dad show off his super powers while getting a good nights sleep with these creative superhero eye masks! Paper cards get tossed out but a wooden card can be displayed as a “photo frame” on a mantel, office desk, or dresser. Help dad relax AND smell good with handmade soaps with essential oils. It will also give your child a chance to learn about the benefitsofo using essential oils. Candy Jar – Free Jar Label Printable! For all the candy loving dads, let your children fill up a mason jar of dad’s favorite candy and attach one of the free jar label printable. Especially for the younger children, these can turn out quite humerous! Kids always come up with crazy stuff! Skrinky Dinks are so much fun. Let your child draw their version of Dad. This is a great gift for an older child to make whose dad loves to cook. Allow your child to add their favorite photo of them and dad! The bottom of the box can even be used to display the “Dad Rocks” gift idea below! The possibilities are endless of what your child draws! Hand painted rocks are something that has been a fun craft for children for many years but has exploded in popularity over the last year. Make a paperweight for dad’s desk to remind him how special he is! Buy any wooden hammer and allow your child to personalize it just for dad! This can be done as a keepsake with even a baby’s footprint! Another one of those crafts that you never know the humor that might come from having your child depict dad through art! Make a frame using old Scrabble tiles! I would love to see your child’s creations. Post to Facebook and tag @myfourandmore so I can see them! This entry was posted in Get Crafty! and tagged DIY, fathers day, gift ideas, Gifts by Amy Smith. Bookmark the permalink. Oh my goodness! Some of these are so cute! Pinning for use later. Thank you! My dad is a tool guy. He would really love the measuring tape bow with washers on it. These are some great ideas that my kids can do. I love the hammer & key rings. These are great ideas! I like the photo holder. These are great idea, I love homemade gifts.